The 21 day Dust and Delight motorbike tour is designed for bike travelers who want to ride through more remote, untouched areas and since we travel on many trails, unsealed roads and have to cross rivers, off-road experience is recommended as well as a reasonable level of fitness. If you ever wondered what it felt like traveling through New Zealand in the early days, then this tour is for you. It is a unique combination of “must visit” destinations and back-country panoramic landscapes which your ride through rather than past. Your luggage will be transported in a support van by a guide and there will also be a guide riding with you as the support vehicle can't drive through some stretches of this tour. During your bike tour there will be plenty of time for other activities and to experience some Kiwi hospitality. Riding days are in general, between 200-350 km and there is time allowed for personal discoveries and rest days for other activities or extra riding, of course. The following tour brief is an outline of what awaits you on your 19 days of exploring the New Zealand back country. We leave the city behind and head for the hills of the back country. 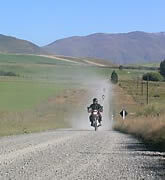 The majority of the riding in the central south island is on small gravel roads through open landscape often on private land with connecting sealed roads for fuel ups and lunches. We travel through the McKenzie basin and the central Otago goldfields, these regions offer some exciting back road riding through scenery featured in various movies. While in the southern region of the country, we have naturally included a visit to Queenstown, where there are further possibilities to explore trails and historical gold mining sites from a bygone era. Leaving the south we head up the west coast with glaciers and native forests. With our new gained skills of negotiating pot holes and avoiding roaming sheep we traverse the Southern Alps on old coach trails to make our way up to Picton. It is a volcanic landscape with magical, dense forest and very twisty roads, which requires concentration to ride. We travel through the King Country and visit some derelict ghost towns on the way to the west coast. From here we zigzag our way northwards before reaching Auckland.